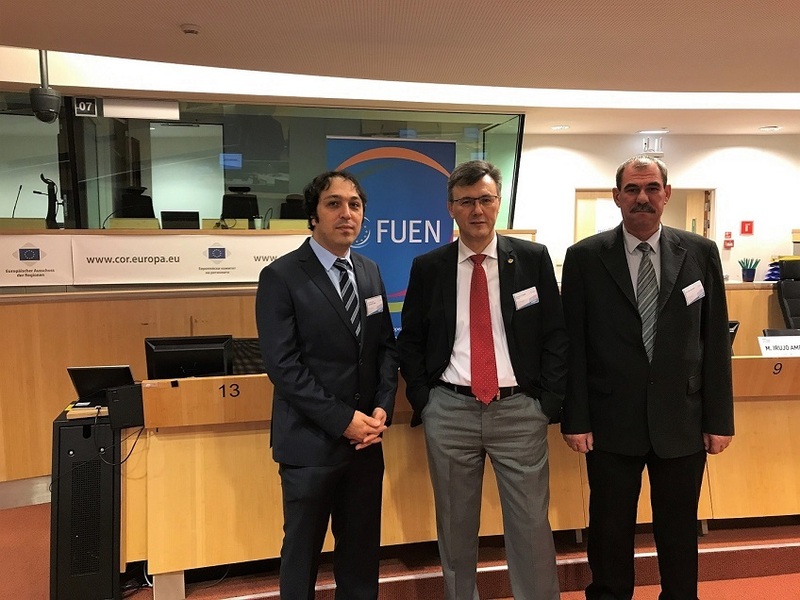 At two-day conference organized by the Federal Union of European Nationalities(FUEN) contributions of local and national minorities to economic and cultural development of the regions they live in and their bridge-building roles in cooperation among the regions were discussed. Federation of Western Thrace Turks in Europe (ABTTF) attended the conference on ?Deeply Rooted in the Regions: Minority Communities and Language Groups in the EU Regions? organized in Brussels, the capital of the European Union (EU) between 30 November-1 December 2017. ABTTF President and FUEN Vice-President Halit Habip Oğlu, ABTTF Vice-President Sami Yusuf and ABTTF Head Office Manager K. Engin Soyyılmaz participated at the conference hosted by the Committee of Regions in the European Parliament and organized by the Federal Union of European Nationalities (FUEN) of which ABTTF is a regular member. At the conference where Members of the European Parliament(MEPs) Csaba Sogor and Iuliu Winkler were speakers, Lorant Vincze, President of FUEN, made the opening speech. At the conference it was stated that regional policy is one of the main themes of ?Minority SafePack Initiative (MSPI)? launched by FUEN in EU-wide to create a minority protection. It was emphasized that a call was made to the EU to change conditions of tregional funds and cohesion policy which would include protection of national and local minorities and strengthen linguistic and cultural diversity in Europe. In the panel on minority and minority friendly regions, ABTTF President and FUEN Vice-President Halit Habip Oğlu has taken the floor as a panelist and unpinned the importance of the dialogue between the majority and minority. Habip Oğlu stated Western Thrace Turkish community living in Greece is always open for a dialogue, and added that the Greek government, however, avoids insistently getting into dialogue with Western Thrace Turkish community. Habip Oğlu expressed that the minorities could only exist with their languages and cultures. He further noted that while Greece claims itself the cradle of civilization, it, however, does not apply the democracy in the country and tries to abolish autonomous structure in education and religion of Western Thrace Turkish community. Habip Oğlu added that Greece does not allow for associations with ?Turkish? name. Habip Oğlu noted that unfortunately without dialogue problems would not reach any solution and stated that despite denial policy of Greece, Western Thrace Turkish community would not surrender looking for dialogue with the Greek government. Closing speech of the conference was delivered by Karl-Heinz Lambertz, the President of the Committee of Regions and a member of MSPI Citizens Committee. Lambertz told that national delegations of two countries called requested him not to host this conference and added that these countries were France and Greece. Lambertz indicated in his speech that minority rights should be added to general policies of multilingualism and regional cohesion of the EU and he proposed the creation of an inter-regional group encompassing the border regions or minority regions within the Committee of Regions and suggested to propose a resolution supporting the MSPI at the Committee of Regions.